plantainperiodicals | Life, Love and Plantain! Zambia has enjoyed 49 years free from colonial rule. It has been years of peace and we pray God continues to bless us. My heart embedded deep within her womb. Held her in your palm, with peace showed her that love was the revolution. Asserted the right to have the right to be one. One Zambia, one nation, one child, one generation. Chimamanda Ngozi Adichie states “The real tragedy of our postcolonial world is not that the majority of people had no say in whether or not they wanted this new world; rather, it is that the majority have not been given the tools to negotiate this new world.” I found the point Adichie made about people not having the tools to negotiate this “new world” interesting. You see I think a lot of us do have the tools we need. The only problem is they are probably not in the best shape needed to get the impact we want. An example is, most of us are able to talk to people. What separates us is that some are able to communicate well to get a desired end, while others cannot communicate so well and are therefore at the mercy of another’s end. Another example is survival instinct. Our bodies are wired: fight or flight. We either rise to a challenge and fight for our lives, or surrender to fear and run away/ escape the situation. Chimamanda Ngozi Adichie also makes the point that once one story is told to a person enough times, it become their story. This is the self fulfilling prophecy. The rule of the prophecy is that people become what they are told and what they allow their minds to tell them they are. In the case of some black people it would mean that re – living the oppression and letting the fact that we are of different races be a controlling and deciding factor in their lives. Surely that cannot be right. Do not get me wrong, I get that black people before me and even now struggle for their independence. But the vision and rhetoric of these struggling people was and is peace. Somehow I think that a lot of Black History ‘Celebrations’ have missed this? I was at a Phase One event on Friday, meeting with some like – minded, ambitious, socially conscious, yet friendly group of people. It was a networking event so there was loads of time to eat and get to know people, but there was also a panel. The panel consisted of people who have their own successes in different fields. One of them was Kyla Frye. From what I understood of Kyla, she is a successful actress who has started her own company, with a mission of putting ethnic minorities on the TV and in media in a way that ethnic minority communities can relate to. So this goes beyond the sweeping stereotypes. It is about real characters who are representative of the range of personalities and identities. Kyla stated her vision and because I had spent some of last week watching Top Boy, it made me think about the rise of what I will call ‘Street Dramas’. Things like Top Boy, Adulthood and Kidulthood have done a great job at highlighting some of the very real social issues among young people and the street/ gang culture prevalent in British society. Note I say British because the gun and knife crime experienced in London, is not exclusive to London. Various cities and smaller towns also have these issues (though some could argue to a more/ lesser degree). Nevertheless I started thinking about the representation of ethnic minority young people that is available to young people. The most prominent is probably that of the street dramas. Now the problem with this is – can a young person (so 13 – 16), look at the drama critically and understand that the life style portrayed is not to be aspired to? Can the majority of young people see that although a gang is like a family, allegiances switch in a heartbeat. Can the average 13 – 16 year old see that the gang community is a sub culture, one that goes against societies norms and values and because of that, is one that will invite stays in prison, disputes being resolved with a knife or a gun and drugs controlling people’s lives…And that all of this is not an easy ride. I don’t think most young people can. Now I know some of you may be thinking, the parents should be monitoring what the kids watch, but we all know parents monitoring anything these days is a struggle. So what do we do? I say we, because there is collective responsibility for the communities and society we create. Let me first say that I love programmes like Top Boy and believe in their value and would encourage such dramas to continue to be made. However as Kyla Frye states, we need variety – these cannot be the only dramas where we see ethnic minorities that we can relate to. Yes other dramas do have ethnic minorities in them, but as a community we also need to do more to create media that our young people can watch and engage with, that gives them something to aspire to. Theatre at the cinema: Manchester International Festival’s ‘Macbeth’. This time last week I was getting ready to watch Macbeth. It was a completely new experience for me. The National Theatre live broadcast of Manchester International Festival Macbeth was introducing Nissi Mutale to live theatre, not so live. So here was I getting ready to go to the theatre and cinema all at once. Confused…you should be. So, The National Theatre show live screenings of theatre productions at cinema. Amazing right?! Maybe you are not as late as I am, and already knew this happened, but I did not. Anyway, immediately I had loads of questions; what would be added to the experience? What would be lost? Would I ‘get’ what the sound and lighting were trying to do? Would the production have a more cinematic feel? Would I be conscious of the fact that the camera wasn’t at the right angle? Would I be thinking about what I am not seeing and feeling because of the camera angle?…And believe me, the list went on. Watching the show I completely forgot about all these questions. That has to be a good thing, right? The show was amazing! 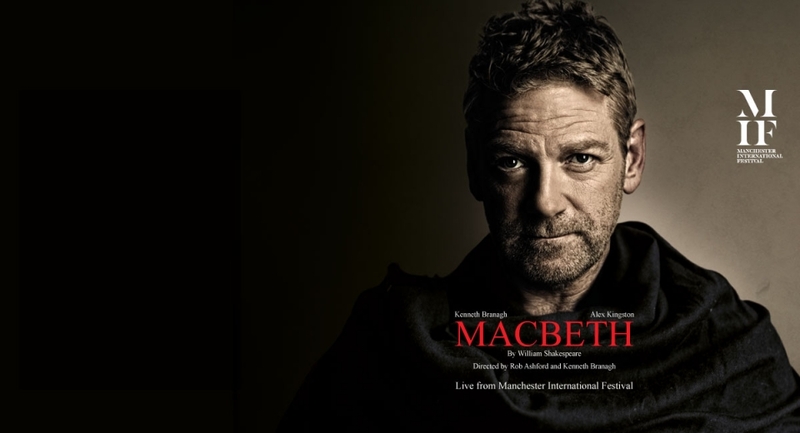 Kenneth Branagh as Macbeth, Alex Kingston as Lady Macbeth, Ray Fearon as Macduff directed by Rob Ashford and Kenneth Branagh – dream team! The production was staged in a deconsecrated Manchester church on a catwalk type stage – audience on either side. The actual stage was covered in mud. The contrast of mud in a church made me think about the amount of dirt the characters would pick up as they walked up and down. The build up of mud symbolic of the growth of evil and sin as the story unfolds. The eeriness of the witches coming out of the church walls also showed how evil had crept into everything, the selfish ambition of Macbeth and Lady Macbeth evident and ill placed from the beginning. Out, damned spot! Out I say!…Yet who would have thought the old man to have so much blood in him. What, will these hands ne’er be clean?….. Here’s the smell of blood still: and all the perfumes of Arabia will not sweeten this little hand. Oh oh oh! Set against the backing of the church, a new dimension of the lines is emphasised. Unable to confess and repent of her sins (as is practised in Christianity), Lady Macbeth is unable to simply wash away her sins. All in all it was an amazing production. I did not take notes to bring a huge breakdown to this blog, but felt I had to, absolutely had to write something. The reference to Cristina Thomas is a memory Ifemelu has of first arriving in America and having the admission assistant struggle to understand what she is saying. The way the assistant questions Ifemelu’s English leaves her feeling vulnerable, sub-standard and determined to ‘fit in’. Ifemelu starts practising the American accent, phrases and way of speaking until she is perfectly able to hide her Nigerian accent. The way Adichie explores identity through accent here is interesting because it highlights how the very way we speak is vital. We may all speak English but the way we pronounce words leads to certain perceptions and preconceptions. Accent determines the way others view you and how we view ourselves. The way we speak shows the allegiances we have made consciously and subconsciously. If I use myself as an example, I grew in a Zambian household, in England. Both my parents had and still have Zambian accents. So until the age of about 13 I also had a Zambian accent. However around people other than my family, I sounded English. I adapted the way I spoke according to who I was around. I did not want to stand out. I did not want to be African around my English friends. I wanted to be one of them. From a young age I was aware of a divide simply by the way my friends spoke and the way I did. I would switch between the two. Thankfully I have grown in my identity and am coming to understand the complexities of being Zambian, African, Black British and simply being me all at once. Now I just speak. I do not have to think about my accent and the way people view me because I am happy being me. Some words come out sounding more ‘Zambian’ than others, some do not, and that is fine. I think the important point Adichie makes here is that accent is an important social indicator. Our accents say a lot about us. Therefore if we are trying to be something by the way we speak, instead of just being…there is a problem. I have decided to add a new section to this blog where I will talk about books I am reading or have read. I read a lot! So I thought it only made sense to share my thoughts on some of the stuff I come across. I read a variety of literature, faith and self-help books. So to kick this section off, the author I am fascinated by at the moment is Chimamanda Ngozi Adichie. I first read a book of hers around a year ago. ‘Half of A Yellow Sun’ was recommended to me by a friend who did not even really read, so that was immediately promising. Since then I have bought all her books on kindle. I am impressed. Anyway the book I have just read is the new book by Adichie ‘Americanah’. The book explores a number of issues including; the black immigrant identity, transition, inter-racial relationships, class, class struggle, blogging, online identities and so many other issues. The main character Ifemelu is a 20 something year old who has moved to America to study and increase her opportunities in life. Like many Africans outside of Africa, Ifemelu has moved to America hoping to build a better life for herself. Adichie takes the reader on the journey of excitement, discomfort, pain, searching, temporary excitement, dissatisfaction, realisation and longing for home, I for one have experienced as an African abroad. Despite having the comforts of family and my parents moving to England from Zambia when I was a baby, I still had identity issues I had to work on growing up as an African in Britain. I may not have had to deal with the passport and immigration struggles that many do and I will never for one moment pretend I know what that feels like. However that feeling of knowing you are different to everyone who is not African (and that includes Asians, Black British, Black Caribbean, Caribbean, English, those of mixed heritage…everyone who is not African…in my case everyone who is not Zambian), there are issue you will need to deal with. This journey is depicted in the small and everyday happenings we take for granted: getting hair done, wondering how people perceive us based on the relationships we have, our social groups, the house and part of town we live in, our online profiles, these aspects are brought together to get the reader to think about African identities (represented by Ifemelu’s Igbo identity). I say identities because we know that there can never be a singular. Stereotypes are singular but Adichie challenges stereotypes in her book so that even the caricature is somehow plural. Over the next few weeks I will be posting my thoughts on certain parts of the book that stood out for me. I hope you will be challenged, chastened and cheered by it all!